Cookie Rojas should know a thing or two about judging infielders. A five-time All-Star who led his league in fielding on three separate occasions, Rojas made a strong case for Rey Ordoñez’s 1999 season as one of the best ever for a major league shortstop. Rojas was in New York City last weekend as part of the Cuban Cultural Center of New York’s “History of Cuban Baseball” program at Fordham University. 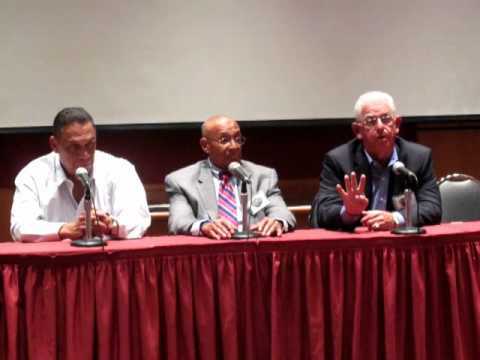 Speaking as part of a player panel which included Hall of Famer Tony Perez, Minnie Miñoso, Luis Tiant, Julio Becquer, and José Cardenal, Rojas was asked about Ordoñez’s place amongst the all-time defensive shortstops. He put on his manager hat and responded swiftly and succinctly. Rojas joined the Mets as a coach in 1997, one year after Ordoñez debuted at Shea. Coming off a season where he [Ordonez] committed 27 errors, Rojas knew things had to change. Ordoñez improved quickly, committing only nine errors the season Rojas arrived. Nineteen-ninety-seven was the first of three consecutive Gold Glove campaigns for the Cuban shortstop. Rojas explained how he helped Ordoñez to improve by getting him to forget his struggles at the plate while he was in the field. Involved in professional baseball for over 50 years as a player, coach, manager, and his current position as the Spanish Language broadcaster for the Florida Marlins, Rojas had many opportunities to analyze the top defensive shortstops in both leagues. After a careful pause, Rojas offered the following about how Ordoñez’s magical 1999 season where he made only four errors ranks among the cream of the crop. “Let me say I knew a great defensive shortstop who played for Almendares [in Cuba], his name was Willy Miranda, a defensive all-time great. But what I saw Ordoñez do that year, I have never seen a shortstop do in my whole life, anywhere, not even one of the all-time greats [Ozzie] Smith, a Hall of Famer,” he said. “How Ordoñez played that year was incredible. It was ... to see a defensive shortstop do what he did, one of the best that I have seen in my whole career." A special thank you to fellow SABR member Tito Rondón for his translation of Rojas’ interview from the player panel. * This was originally published for Examiner.com August 27, 2011.